In anticipation of the holiday, February 22, in the House of fleet officers held a solemn meeting of the Vladivostok garrison soldiers, representatives of the regional and city authorities, veterans, students of military-Patriotic clubs and members of the public. The event will end with a concert program. February 23 at 12.00 will begin the solemn ceremony of laying wreaths and flowers at the Eternal flame memorial military glory of the Pacific fleet. The event will be attended by veterans, pupils of military-Patriotic clubs, schoolchildren and members of the public. 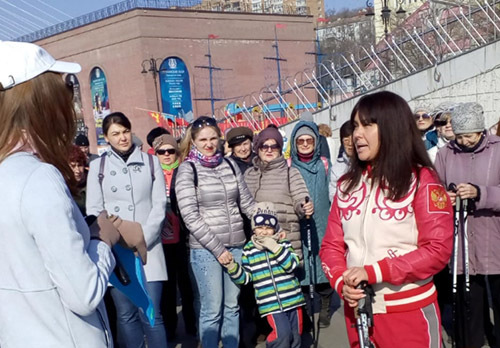 Then, the ceremony participants will be held on the Central square, where flowers will be laid to the stele "city of military glory" in memory of Vladivostok residents who gave their lives for a peaceful sky over their heads. Also on the Central square will unfold exhibition of military equipment and weapons, and all comers will treat this soldier's porridge from the field kitchen. The organizers promise to feed her at least a thousand people. 08.10.2017 "Primorye Education: Points of Growth"